Elijah is teething for almost two weeks now. Good thing he didn’t have any rashes in his face. It’s really frustrating when he keeps on crying and I don’t know what to do. I know how painful it is. Elijah can’t sleep at night and loves to breastfeed all day long. It’s funny because Elijah’s has only seven teeth. 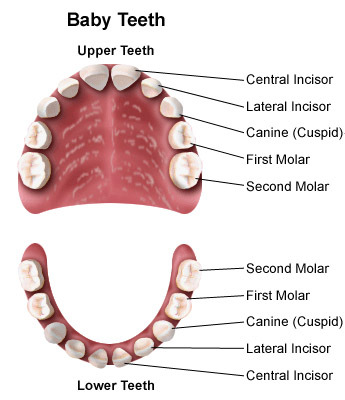 Four in the upper teeth (central and lateral incisor) and three in the lower teeth ( 2 central incisor and 1 lateral incisor). We are waiting for the four teeth to apppear which are the upper molars both upper and lower teeth. He is now experiencing high fever since yesterday and I am giving him Calpol drops to ease the pain every four hours. Many mommy bloggers are advising me to give him cold foods such as ice cream and refrigerated butter but he refused to take those. What I do now is nothing. I just let him play whenever he wants and watch his favorite kiddie programs. When he’s in pain, I’ll just breastfeed him. uuggh! a very delicate situation. my kids used to have fever when they were teething..